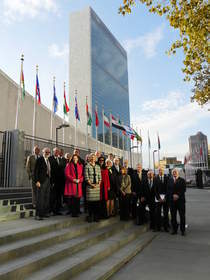 NEW YORK, NY and PARIS, FRANCE--(Marketwired - Oct 29, 2014) - FIABCI, the International Real Estate Federation, was one of the organisations representing property and related professional services from around the world which met at the United Nations in New York last week (22-23 October) to establish the International Ethics Standards Coalition (IESC). The Coalition, which is made up of leading professional bodies from Asia, Europe, Oceania, North and South America aims to develop and implement the first industry-wide ethics standards for property and related professional services. Member organisations of the coalition, many of which already have their own codes of conduct focusing on things like trustworthiness, integrity and respect, will seek to align fundamental ethics principles through the new international standard. The ultimate goal is that professionals will undertake their work in an ethically consistent way, regardless of where in the world they are located and the nature of their work. The Coalition is hopeful that the new International Ethics Standard will be ready in early 2016, following which the member bodies of the Coalition will implement it through their own training and guidance to professionals. "Over the last quarter century, the property market has become truly global covering all aspects of commercial and residential development as well as institutional investment. Numerous ethical codes already exist with common principles promoting integrity, transparency, trustworthiness and professional competence. However, up to now there has been no united voice or single, clear set of fundamental standards applied worldwide. The new Coalition has the potential to transform the public perception of the entire real estate industry by creating and implementing international standards of ethical conduct. This, in turn, will help to enhance confidence and stability in the global market place, leading to improved ratings for property as an asset class." The Coalition hopes that the introduction of clear and transparent international ethics standards will improve professional services and promote stable property markets around the world. The ethics principles set out in the standard will be drafted and published for public consultation by an independent group of experts, which will be appointed by the Coalition early next year. The expert group will represent both the diverse nature of professional practice as well as the international scope of the project. Professional and not-for-profit organisations are being invited and encouraged to join the International Ethics Standards Coalition now by contacting any of the below listed organisations for more information. FIABCI, the International Real Estate Federation, is a business network of real estate professionals worldwide. FIABCI provides access and opportunity for real estate professionals interested in gaining knowledge, sharing information and conducting international business with each other. With members in 65 countries, including 100 Professional Associations, 65 Academic Institutions and 3000 individual members from all professions of the real estate sector, FIABCI is the most representative organisation of the real estate industry in the world and holds special consultative status with the Economic and Social Council (ECOSOC) of the United Nations. Organisations representing property and related professional services from around the world met at the United Nations in New York last week (22-23 October) to establish the International Ethics Standards Coalition (IESC).